China is hoping to create an army of soccer heroes to become a world-class powerhouse in the men’s game. Can foreign coaches and their more relaxed methods succeed where the punishing training regimes of the past failed to get past the post? 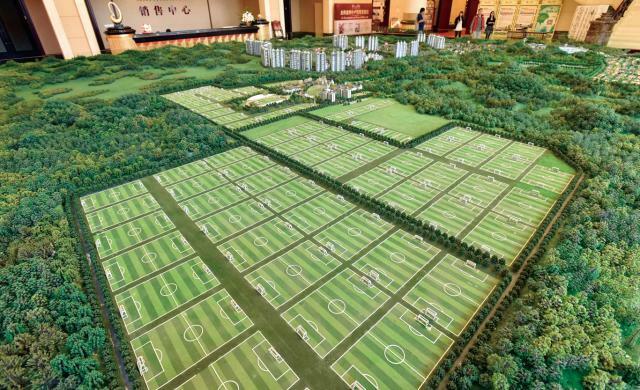 Spanning an area of 120 hectares with 50 full-size pitches and a squad of Spanish coaches through a partnership with Real Madrid, Evergrande Football Academy is not only the biggest soccer school in the world, it is arguably the most ambitious. The school, in Qingyuan, a prefecture-level city in the north of Guangdong Province, cost an estimated US$185.3 million to complete in 2012. The campus, built by real estate developer Evergrande, features two dozen chateau-style buildings, the main building adorned with a colonnaded entrance, a clock tower and turrets. There are European piazzas fringed with tropical plants and facilities such as a cinema, gym, basketball courts, library and several cafeterias, all to cater to the 2,800 students – only 200 of whom are girls. A 12-meter replica of the FIFA World Cup trophy stands outside the front gate, reminding staff and students of their end goal – to win the World Cup one day. China has been investing big money in recruiting big-name foreign stars, but efforts to manufacture top homegrown players have proven more difficult. Now the country is forging partnerships with international clubs and soccer associations to cultivate its next generation of soccer stars. 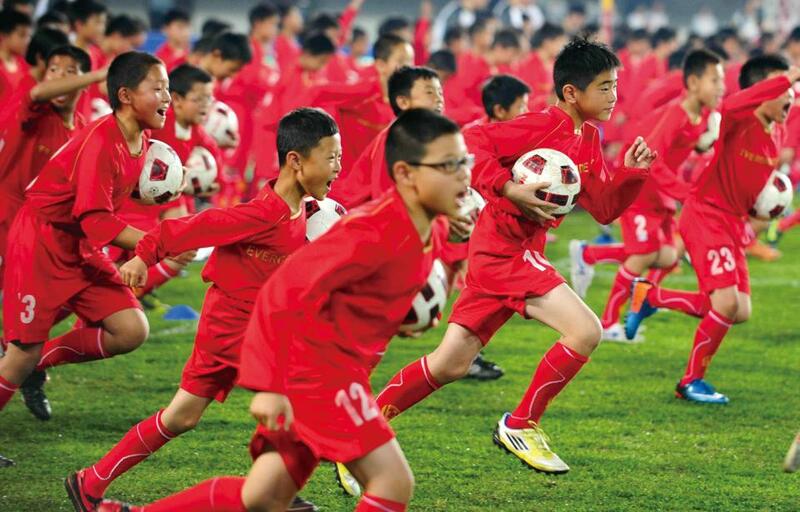 In March 2015, the Chinese government unveiled a 50-point plan for Chinese soccer that called for youth development. Chinese President Xi Jinping, an avid soccer fan, announced his intention for China to become a “soccer powerhouse,” encouraging investments in the sport from private, public and national sectors. Youth soccer is key to the country’s big plan. Yet, whether or not the government-driven revolution can manufacture soccer success remains to be seen. For years, soccer in China has been a source of national embarrassment. The country is known as a global sporting superpower, topping the medal tally at the 2008 Beijing Olympic Games. But for a soccer-loving nation of 1.4 billion, China still finds it hard to present a squad of 11 capable male players to participate in the World Cup. The Chinese women’s team have always performed consistently better that their male counterparts, winning several Asian Cups and reaching the finals of the 1999 FIFA Women’s World Cup. Though soccer is China’s most watched sport, its current FIFA world ranking is 75, currently behind war-torn Syria (73) and the tiny Cape Verde Islands (65). China’s men have qualified for the World Cup only once, in 2002, when the tournament was co-hosted by Japan and South Korea. The national team failed to find the back of the net in any of the three games in the group stages before being sent home. Despite the tens, or hundreds, of millions of fans cheering the squad on, the country is repeatedly humiliated on the soccer pitch. After receiving a soccer ball signed by South Korean star player Park Ji-sung (who played for Manchester United) at a meeting in July 2011 with the leader of the Democratic Party of South Korea, Sohn Hak-kyu, Xi had told the Korean guests of his personal three wishes: that China would qualify for another World Cup, that it would one day host the event and that it would one day win one. Domestic teams have seen some recent successes, including in the Asian Champions League, but it comes on the back of heavy investment in foreign players and coaches. Evergrande has won the Asian Champions League twice, in 2013 and 2015. The domestic Chinese Super League (CSL) has burned millions of dollars signing foreign stars. Shanghai SIPG shelled out US$72 million to sign Brazilian Oscar and Shanghai Shenhua spent US$41 million to sign Argentinean Carlos Tevez. In 2015, the government issued a soccer reform plan, determined to turn the country into a world-class player in the game by 2050. Fifty million citizens, including 30 million schoolchildren, are expected to be playing soccer regularly by that year. According to an announcement from China’s Ministry of Education (MOE) on February 1, 218 schools were selected to offer soccer-specialized education from July 2017. Wang Dengfeng, director of the Physical Education, Health and Arts Department of the MOE, says that the biggest hindrance to youth soccer development in China lies in the lack of the qualified coaches. In response, over the past three years the central and regional sports and education authorities have trained 230,000 sports teachers and soccer coaches. Five coach training centers have been established and 1,100 coaches have been sent to France and the UK for three-month training programs. The school has around 2,800 students aged between eight and 17 years old. Tuition costs 50,000 yuan a year (US$7,554), and only players judged talented enough can receive a full scholarship or some form of assistance. Twenty-four Spanish coaches provided by top La Liga side Real Madrid as well as 116 Chinese coaches have been hired to train the students. Players and managers, from the Spanish side, including former Real player Cristiano Ronaldo, have visited. Students are divided into two groups: elite and regular players. Elite players are eligible for scholarships as well as some privileges such as access to the Western food canteen. The best are sent to Spain for a three-year training program when they turn 13 under more senior coaches from Real Madrid. In the future, they will have a chance to play for Guangzhou Evergrande Taobao, one of the best club sides in China. “Our academy has 2,800 children, but currently we haven’t seen a [Lionel] Messi, nor a Cristiano Ronaldo. But with this strong fostering of young soccer talent, I believe China, with its more than one billion population, will definitely produce outstanding players,” Xu said in March last year at a press conference during the Fifth Session of the 12th National Committee of the Chinese People's Political Consultative Conference (CPPCC). Even though Xu was a frontrunner in paying big money for foreign stars for his club, he stressed at the meeting that instead of competing to import foreign players, the focus of investment should be directed toward nurturing youth soccer. Midfielder Tan Kaiyuan, a 17-year-old from Qingdao, Shandong Province, is one of the most promising players at the school. Tan’s role model is Harry Kane, striker for English Premier League club Tottenham Hotspur, and winner of the Golden Boot award at the 2018 FIFA World Cup. Tan was among the school’s first students after being admitted at the age of 11 in 2012. Very soon he overshadowed his peers and was chosen to go to Spain for two years. His experience broadened his outlook and significantly sharpened his skills. The boy was impressed by the rich soccer culture there. “Spain is perfect to play the game. Everyone is so enthusiastic about the sport – even the security guards at the club play,” Tan said. In March, Tan was recruited by Guangzhou Evergrande, making him the youngest player in the CSL. “It’s every athlete’s dream to be the best. I just need to try my best to make progress step by step,” he told NewsChina. Passion for soccer can be found even in the most remote corners of the country. Zhonglianchuan Primary School, in Yuzhong County, Northwest China’s Gansu Province, is one such place. Founded in 2011, the school has 13 soccer teams, and love for the game has become an indispensable part of life for every student. Every day, they train for one hour in the morning and 90 minutes after school, and different teams play matches between regular classes. This dedication has helped the school’s soccer squads excel in both provincial and national-level youth matches. The school has become so well known that it was selected by the local government to be a role model school to develop youth soccer. So far, six of its students have been enrolled at Evergrande Soccer Academy and 20 others have been chosen to attend a famous sports school in Lanzhou, Gansu’s capital city. Last year, eight students headed to London for a 15-day training course at Arsenal Football Club. “Our model follows two principles: the first is full participation – every student is required to join the sport; the second is promoting soccer education as part of a well-rounded education. Our aim is not to train professional players but to let every kid enjoy their study and life through the sport,” Ma told NewsChina. Although the school earned its reputation thanks to its excellent soccer performance, it still faces a serious predicament: the number of students has dwindled year by year. Currently the school only has 66 students. The decline in student numbers is a common phenomenon in remote village schools in the country. “Our school is in the most impoverished village in Gansu. Many people have no choice but to leave for cities to work and they take their kids with them. There aren’t many kids left here now,” Ma said. For 16-year-old Hao Yongxing, a former Zhonglianchuan student who was later admitted to Evergrande Academy, playing soccer was a taste of luxury for children like him. Hao is half a head shorter than many of his peers at Evergrande, a result of long-term undernourishment. His dream of becoming a soccer player can be continued as Evergrande offers funding for students from poverty-stricken areas. “Now many clubs are starting to build under-17 teams. I’m going to look for my chance,” Hao said. With the aim of “building a Manchester United of China,” in 2000, Xu Genbao, 73, a coaching guru known as the “Godfather” of Shanghai soccer, set up a soccer camp in Chongming, a sparsely populated, 80-kilometer-long island at the mouth of the Yangtze River. “Our kids follow a very strict disciplinary regime. We not only teach them skills, but, more importantly, with hard training, we develop good qualities in them – perseverance, self-discipline and fearlessness. You can’t rely on parents to do this. They dote on them way too much,” Cheng Jianhua, one of the school’s coaches, told our reporter. Evergrande Academy’s Spanish coaches have a different approach. There, the concept of “happy soccer” is paramount. Students only train for 90 minutes a day, in line with schedules at Europe’s elite academies. This perceived lack of intensity has been questioned by many parents and also some Chinese educators. Tan Kaiyuan’s father, Tan Senshan, once argued with the school about the amount of training. Before Tan came to the Evergrande Academy, he spent three years training at Shandong Luneng Taishan Football School, where he trained twice a day for two hours each time. Ma Anwu also challenged the training regime. He complained that although six students from his school were enrolled at Evergrande, three could not adapt and quit, and one girl, who used to be top of his school, performed badly against her former classmates when she returned to Zhonglianchuan. training style suits our players,” Ma said. “Evergrande has gone too far [in adopting foreign methods of training] – they opened up a huge school without doing enough exploration and preparation. They should have spent more time accumulating experience and developed step by step,” he added. In an interview with the Sydney Morning Herald, Evergrande’s Principal and vice-chairman of the Chinese Football Association Liu Jiangnan says that traditional rigorous training regimes in Chinese sports focused too much on creating Olympic champions, but risked burning out promising athletes at a young age. The State-sponsored sports development system, which brought success at the Olympics, has not translated well into a team sport like soccer, which requires more intangible qualities like creativity, decisiveness and team work. “We could let kids train longer if parents insist they need to do more. That’s not a problem. But the thing is our kids have already adapted well to this kind of training intensity. A one-hour or one-and-a-half-hour efficient training session improves their response and helps them become more focused and creative. As long as the training is efficient, the duration is not a big matter,” Sergio Zarco Diaz, one of the Spanish coaches at Evergrande Academy said in an interview with Shanghai-based news portal The Paper in February. “At the beginning, there was friction between the two cultures. We can’t ignore the gap between China and Europe in terms of the level of performance as well as understanding of the sport. Over the years, our coaches from both sides have had much communication and collaborated well to follow our method,” Fernando Sanchez Cipitria, director of training at the Evergrande Academy, told NewsChina. At Evergrande, said Cipitria, the level of difficulty in training varies based on the players’ own condition. They will adjust the training plan according to the actual performance of each student. “Our young players have already shown significant changes and progress. They enjoy the game here. Their imagination, creativity and understanding of the sport have improved greatly,” Cipitria said. Now Tan Kaiyuan’s father has changed his mind. “I have to admit the training methods of the Spanish coaches are way more scientific and effective. Many of Kaiyuan’s previous teammates at other schools have quit, since the high intensity of their training caused too many injuries. Kaiyuan has old injuries as well, but his fitness has got much better since he came to Evergrande,” Tan Senshan said. José Ignacio Artieda has been coaching at Evergrande for more than three years. This experience has deepened his understanding of the two different soccer cultures between China and Europe. “Soccer is not merely a business. It’s a culture. In almost all the countries in Europe, people start playing soccer since [they’re] very young. In China, kids are more likely to play ping-pong or badminton,” Artieda said.